This is for sale on my street. My dad wants it as a car to get around town in. The guy is selling because the City of Raleigh sent him a cease and desist because he had three cars on Turo. This car was on Turo, which basically means rental car, but maybe a cut above? 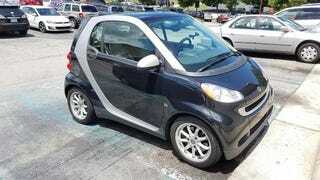 Rides real nice, never driven an Smart before though so I can’t compare it to one I know is sound. $3600 sounds a little high to me, but what do y’all think?